(Nanowerk News) In the year 2015, Intel, Samsung and TSMC began to mass-market the 14nm technology called FinFETs. In the same year, IBM, working with Global Foundries, Samsung, SUNY, and various equipment suppliers, announced their success in fabricating 7nm devices. A 7nm silicon channel is about 50 atomic layers and these devices are truly atomic! It is clear that we have entered an era of atomic scale transistors. How do we model the carrier transport in such atomic scale devices? Atomistic Simulation of Quantum Transport in Nanoelectronic Devices:(With CD-ROM) fills the chasm. Authors Yu Zhu and Lei Liu have experience in both academic research and software development. Yu Zhu is the project manager of NanoDsim, and Lei Liu is the project manager of NanoDcal. 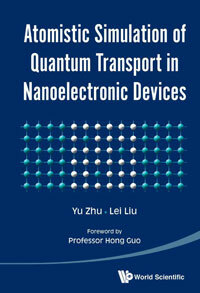 The content of the book is based Zhu and Liu's combined R&D experiences of more than forty years.